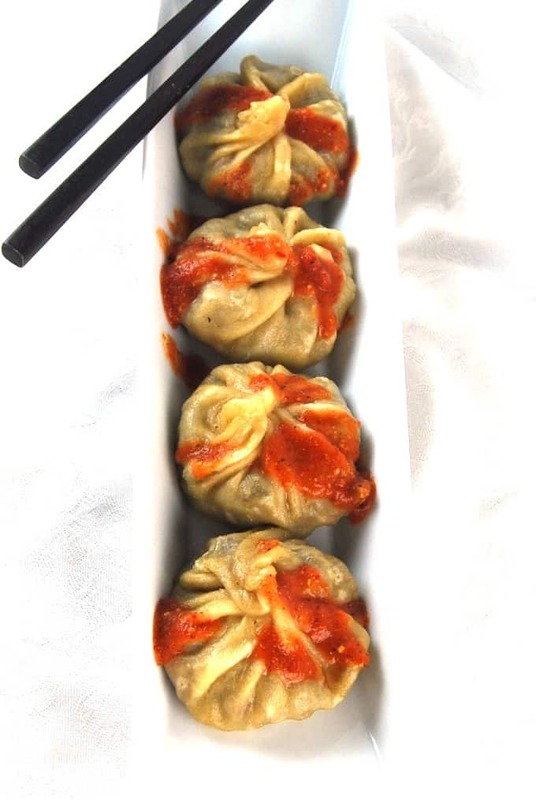 These vegan Momos, traditional Tibetan dumplings that look like little purses, are stuffed with artichoke hearts, mushrooms, carrots, bell peppers and onions. 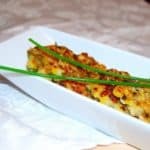 This is a perfect appetizer, and it makes for a great snack too. 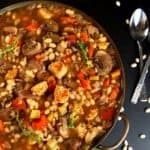 A vegan, nut-free, soy-free recipe. High on the roof of the world, where they were born, Momos are fat little dumplings stuffed with yak meat and vegetables. But today, for you, I have a seasonal — and vegan — version with one of my most favorite flavors in the world: artichoke hearts. My memories of eating great Momos are tied with Ladakh, an enchanting region nestled high in the Himalayas in the Indian state of Jammu and Kashmir. Ladakh is dotted — rather paradoxically — by Buddhist monks and the Indian military, both as a result of its strategic location: it sits smack-dab next to Tibet and, therefore, China, which has a long-running border dispute with India. Ladakh’s beauty is overwhelming — and does a better job of sucking the air out of your lungs than even the dizzying altitude can. The drama begins even as the tiny plane wings its way precariously between the craggy mountains to the small, rustic-looking airport. Once you touch land, thousands of feet higher than where you were just an hour ago, you are surrounded by snow-capped Himalayan peaks. The landscape, in shades of black, white and brown, is stark and barren. Here and there a lake or a river startles you with a vivid, jewel-like blue or green. 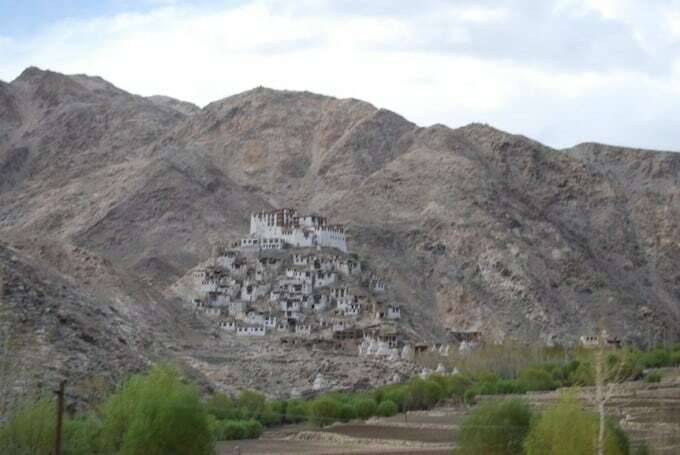 Monasteries and palaces are stacked almost haphazardly along the mountainsides. Our hotel was in Leh, the largest town in Ladakh. 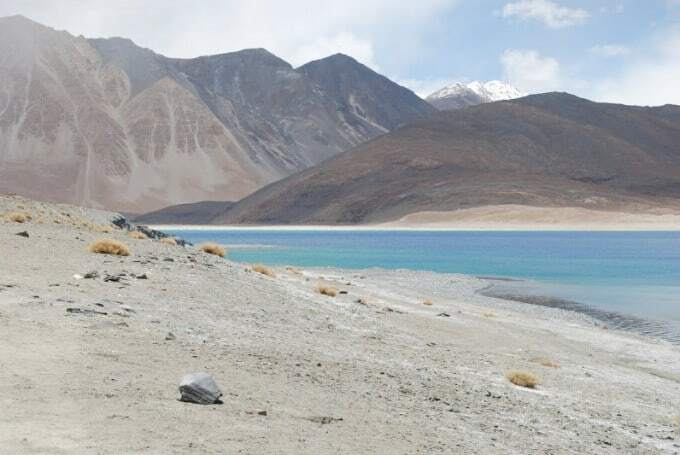 During the day we’d take off in a car with a local driver who could expertly negotiate hairpin bends in the narrow, Himalayan roads, driving even higher than we already were to places like Pangong Tso, an ethereal lake that straddles India and Tibet. In the evenings, we’d walk down to the buzzing street market in Leh. 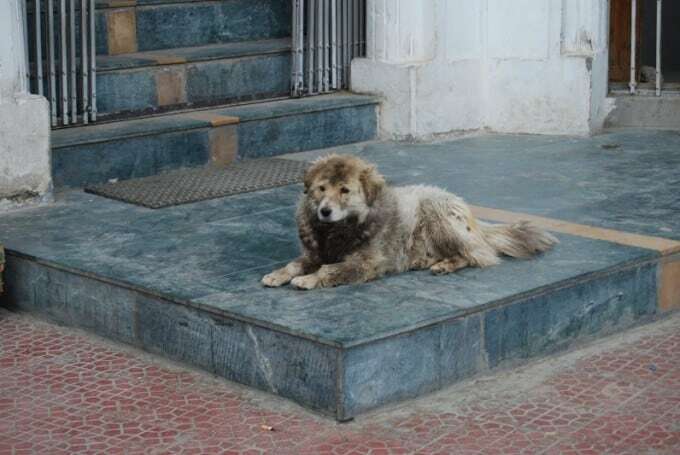 We were always followed by one or more of the dozens of stray dogs who lived along the route –friendly creatures looking for some food. They’d bond with us immediately, eager for a friendly pat on the back and for anything you had to give. Once at the market, they’d try their luck with the food vendors — many of them Tibetan exiles — selling bread rolls, momos, lassi and salt tea. 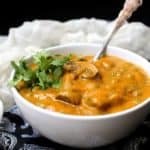 Desi and I do not eat street food while traveling in India (a lesson I learned the hard way during my first trip back after we had moved to the United States– I was determined that as a native Bombay girl, my belly could stand anything. I was wrong). But we were lucky enough to have a Tibetan cook at our hotel who made Momos and other Tibetan foods for us. The momos were delicious– juicy and succulent — and I was hooked. 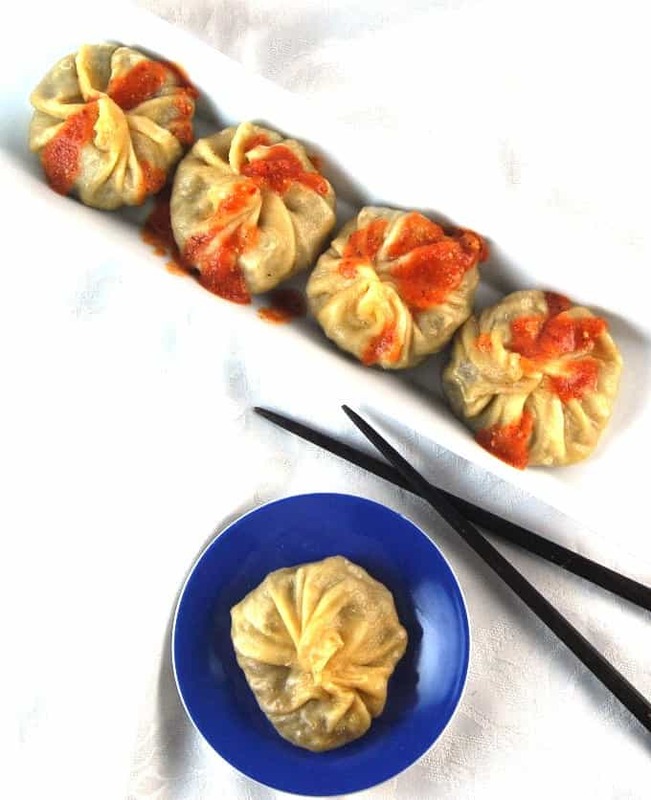 For my vegan Momos Stuffed with Artichoke Hearts, I followed the traditional style of making these little dumplings to the T. If you’ve never made these– or any kind of dumplings — before, don’t panic. 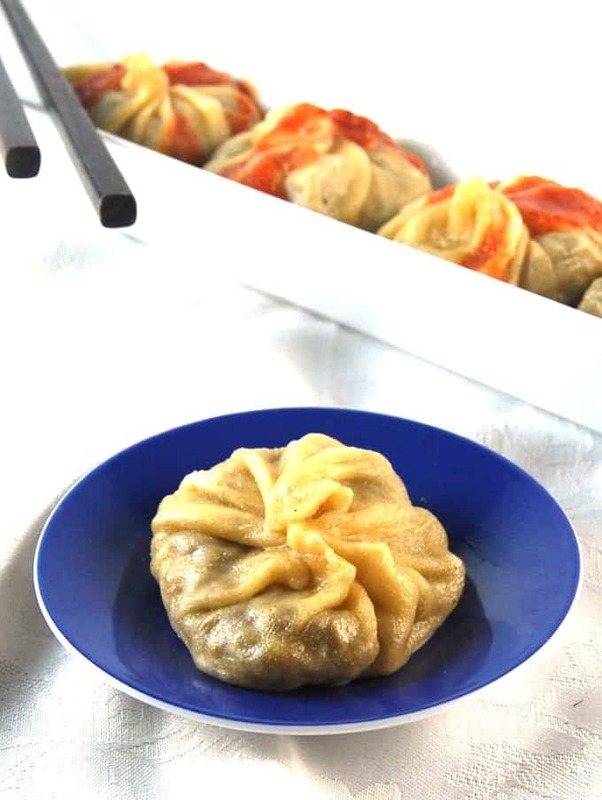 Momos are surprisingly easy to make, and chances that you will mess them up range from zero to none. The only technique you need to exercise is when you seal up the dumplings, and so long as you get an airtight seal, who cares how perfect they look? Trust me, you’ll get better with practice. 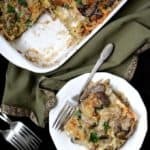 Besides the artichoke hearts, I added a number of other veggies into the mix – onions, mushrooms, green peppers, carrots and spring onion greens. 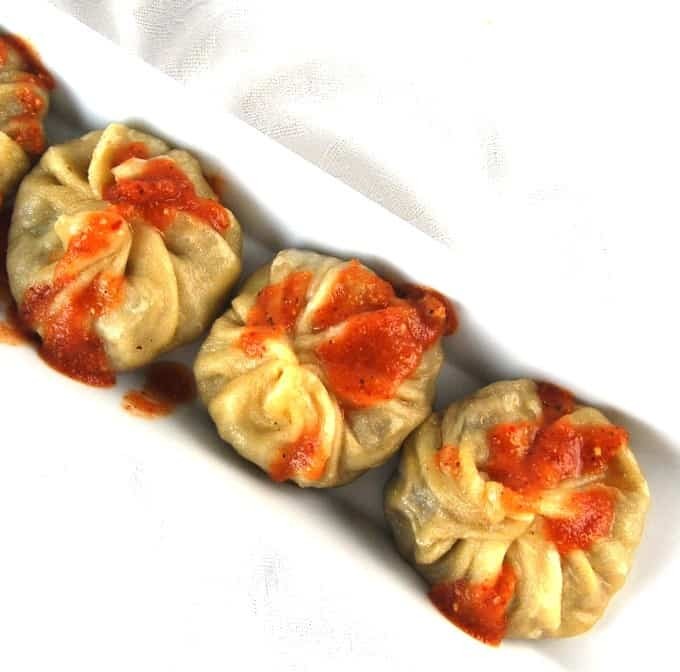 The momos themselves are minimally seasoned, ceding flavor to the red sauce that usually accompanies them. There are many versions of this sauce, but mine I made with roasted tomatoes and roasted garlic. It was mindblowingly good. So here they are, my vegan Momos with Artichoke Hearts. You’ll love ’em. 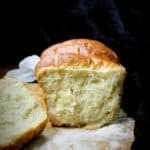 1 cup all purpose flour. 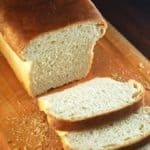 You can try whole wheat or a combination of whole wheat and APF. I like the all-purpose version the best because the whole wheat momos come out a little dense, but they're still tasty. Make the dough for the momo wrappers, by placing the flour in a bowl with the salt and oil. Add a little water at a time and knead to make a fairly pliable dough. Set the dough aside for about 30 minutes to relax. 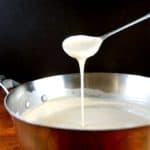 To make the filling, heat the oil in a saucepan. Add all the vegetables except the artichokes and spring onions. Add salt and ground black pepper to taste. Add ginger and garlic. 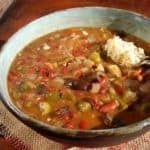 Cook over high heat, stirring frequently, until all the moisture from the vegetables have evaporated and they are tender. Add the artichoke hearts and spring onions and cook until they are just tender, 2-3 minutes. Add soy sauce and more salt if needed. Turn off the heat. 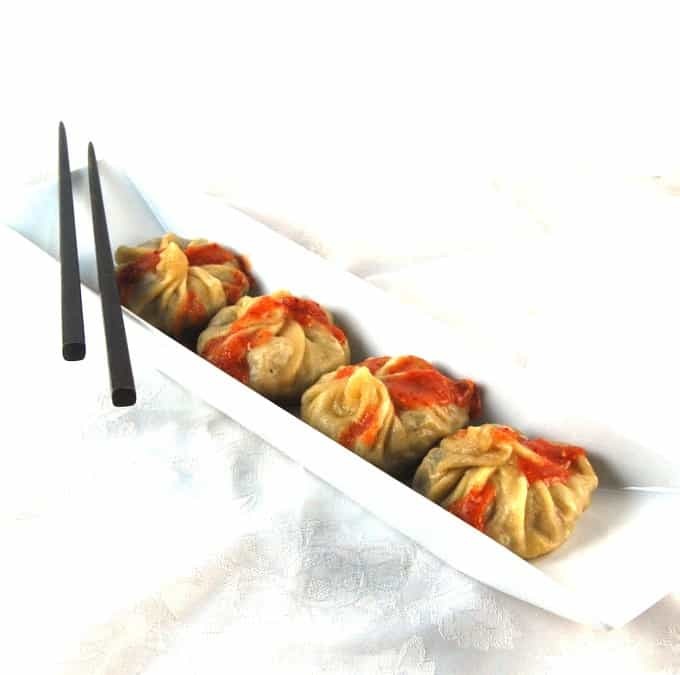 To assemble the momos, divide the dough into 12 equal pieces. Roll each piece into a smooth ball, then roll it out into a circle about 3 inches in diameter. Place 2 heaping tbsp of the filling in the center of the circle. 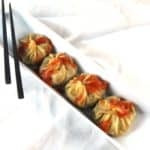 Pick up one end of the wrapper and start forming the momo by pinching the edges up to the top, pleating them as you go. Once you've gathered all of the edges, ping them together at the top to seal them. You can also just make half-moon shapes by placing the filling slightly off-center, then folding one half of the circle over the other, and crimping the edges together with a fork. Heat some water in a pot fitted with a steamer. You can just use any vegetable steamer for this. Brush or spray the steamer with some oil to prevent the momos from sticking. When the water comes to a boil, lower the heat to a simmer, arrange the momos in the steamer basket, making sure you leave at least 1/2 an inch between them. 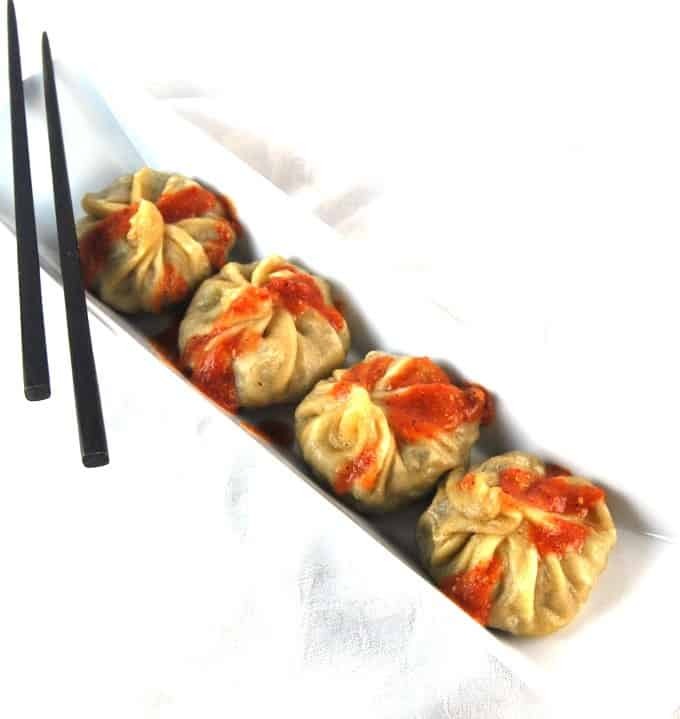 Cover tightly and steam the momos for 9 minutes. The wrappers will turn translucent when they're ready. Remove and serve hot with the red sauce. Place the tomatoes in a foil-lined baking sheet. Cut off the top of the garlic bulb so the tops of the cloves are exposed, wrap the bulb in foil, and place next to the tomatoes. Roast in a 400-degree oven for 30 minutes. In a skillet, dry-roast the red chilies until they darken a shade or two. Place the roasted tomatoes, garlic (discard the skins) and chilies in a blender. Zap until you have a fairly smooth sauce. Remove to a bowl and serve with the momos. 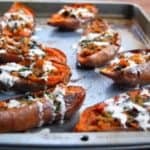 These look great, I’ve seen a few recipes with artichokes lately so I’m curious to try them out! One quick question – for the red sauce, what do you mean by 2 dry red peppers? Hi Heather, two dry red chili peppers. I’ll clarify. Thanks! For the momos, at the bottom of the list of ingredients you have 1 tsp salt and then 1 tsp vegetable. Is that supposed to be vegetable oil? I can’t wait to try these! Hi Rusty, yes, vegetable oil. Thanks for pointing out the slip! I am bookmarking these to make! 1. I never met a dumpling that I didn’t like. 2. I love artichokes. They look so wonderful that I want to eat one now! I will definitely try to make these, as I love artichokes, too. I loved reading about Lada , as well. Darn auto correct! I meant Ladakh, not Lada. Hey Vaishali, Hope all is well on your side. Momo pics looks so yummy!! Veg Momo’s in Indo-Nepal restaurant is my favorite on their menu. 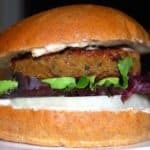 More recipes bookmarked from your site…work in progress! Just made the momos. Filling is very good, but there’s no way a 3-inch circle of dough will hold 2 tbsp of filling., and I did not care for the sauce at all. Made these tonight! First time making dumplings. Found the filling and the sauce easy to follow but struggled with the dough. I don’t think I got the right consistency and when I came to roll them out the dough just kept contracting. I chickened out and as a fall back put the filling into heated tortillas. It was still delicious even if it lacked the wow factor of the little dumplings. Any tips on how to improve my dough. I didn’t put all the water in but stopped when it was already sticky and pliable. Also left it to rest before rolling.